Updates to Tobias' profile since your last visit are highlighted in yellow. Since "89" i have been developing a successful career in commercial and residential construction. Hard work but it has been good to me. Like most i guess, i have seen some immature years on my part. Thank God for Grace. I have enjoyed opprotunities to travel over seas a few times. 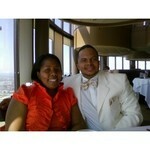 I have been married 10yrs. Tobias Hill has a birthday today.